It's our software we made when we remade this site. Fed up with struggling with over-complicated tools, html tags, and keeping repeating sections of pages up to date? MacroHTML allows you to: include HTML sections or (templates), use Wiki like tag definitions make for much more readable source, to have user defined tags. with fast compilation (this complete site compiles in under 1 second) is is a self contained Windows application. ...... MacroHTML is an HTML pre-processor and compiler thatgenerates html for static sites quickly and easily. Nested include files for repeating structures, tokenising/compiling, link checking etc. What it is not. 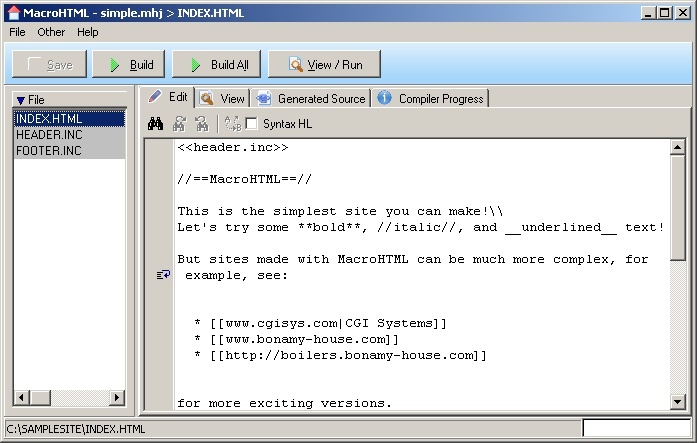 MacroHTML is not a complex, expensive and sophisticated website generation tool. Because of this I cannot offer technical support (except for bug fixes) for people using it. However, the learning curve that it presents should be fairly easy to surmount if you have a reasonable technical understanding of what it's doing and computers in general. Qweas is providing links to MacroHTML 1.4 as a courtesy, and makes no representations regarding MacroHTML or any other applications or any information related thereto. Any questions, complaints or claims regarding this application MacroHTML 1.4 must be directed to the appropriate software vendor. You may click the publisher link of MacroHTML on the top of this page to get more details about the vendor.